Large Wash Bowl/Picher Ridgway Bow & Arrow Pottery mark query:- My Grandmother gave me a large pitcher and bowl about 40yrs. ago. The pattern is in red with birds and possible cherry blossoms. The bowl is somewhat rectangular shaped. 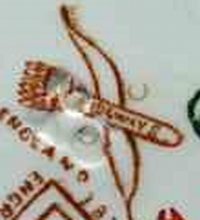 On the bottom its marked in red Autumn also a paintbrush looking arrow with a bow and the word RIDGWAY in the arrow thing, There is also another letter that follows the y in ridgway. Any idea what this is? We normally don't publish submissions without any photos. This is because this site is a very visual record of of fine china. Let's face it your pitcher and wash bowl from your Gran is beautiful because of the way it looks - a pretty piece of English Victorian history. We don't want to see just words, we want to see pretty pictures (we love the story of your items too - as much as you can give). Some folks just write in and say "Estate Sale". Those get deleted too. This site is a mutual help thing - you ask questions and supply nice photos, we help you in return. So that's why, no photos, no publish. Please everyone, get word around about this because we have to delete many submission every day, because we do state loud and clear in the submission instructions that we won't publish or reply without photos. Bow and Arrow mark from Ridgway. We made an exception in your case because we haven't had this interesting Ridgway mark before and we wanted to show it, so dug out one of our own photos and uploaded it on your behalf. This mark was one of the first ever registered in 1880 by Ridgway. They were such a giant company that their marks cover many pages of Goddens encyclopaedia - but this is the first one shown. There are many variation, so without photos we can't help you date your item. The letter after the 'y' is 's'. Sometimes they mark as Ridgway and other times Ridgways. I emailed you to ask for the photos. I have a plate that I inherited from my grandmother with this mark. I didn't find any follow up after Elliott's comment on this subject other than it was Ridgways very 1st mark. Where can we get more information on this mark and it's history. I would be happy to send a picture of my plate if you would like. I have the above 4 piece set complete with the bow and quiver mark, Ridgway name appearing in the quiver. Also it says Sandringham, and I can find no info at all online regarding this, a friend tells me its the name of the pattern. The set is flow blue with a gold rim. I think its Victorian, around 1890, but again another friend suggests Edwardian, around 1920. Would love to know more about it. It was amongst my aunts stuff when I cleared her flat after her death, five years ago. So imagine it goes back some years on my mums side of the family. Anyone able to confirm its history?